When I found out I was having twins, I wondered how it would effect my workout routine and how huge I would get! 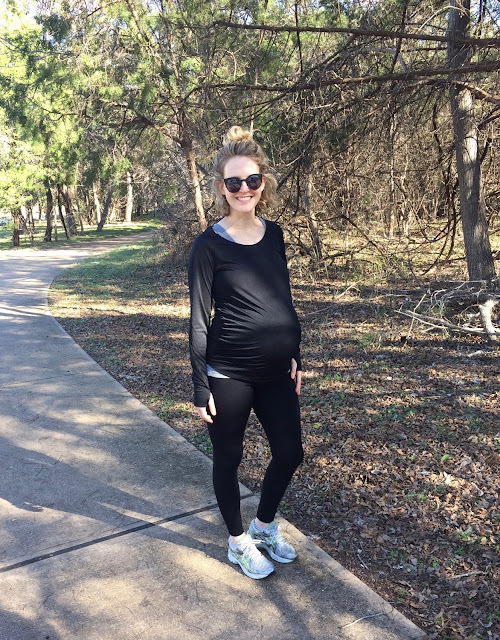 I decided to continue working out as I had before (I did the same with my 1st pregnancy), because I know that staying in shape during pregnancy helps subside many symptoms and helps with labor. Thanks to growing up playing sports, exercising is something I truly love and is a must for my sanity and stress level. I'm a lover of group classes because they are quick, you don't have to think because someone tells you what to do, and the music distracts me from the pain. Here's a quick recap of my workout routine during my twin pregnancy. Prior to becoming pregnant I would do Zumba and Body Pump (weight lifting class) at my local gym down the street. Once I hit the first trimester I lost a ton of enery and felt fatigued often (thankfully no morning sickness or throwing up). Finding the energy to work out was tough, but I didn't hold myself to any specific goals. I worked out when I physically felt able, and I made sure to focus on my core while I still could! I regained my energy, and really enjoyed exercising during this time. I continued with Body Pump classes but cut out Zumba, because my stomach and back did not like the bouncing around. I replaced Zumba with walking (I'm not a runner). I would walk around my neighborhood or at my office during breaks usually 3 times a week for 30 minutes each time. I loved this time to relax and enjoy a podcast. Do you listen to podcasts while working out? I wouldn't be able to do it if I was running because I would need something more upbeat and motivating, but I'm a hug fan of the power walking + podcast combo. Time seriously flies by! By the end of my second trimester I gained a total of 30 lbs. My last Body Pump class was at 28 weeks. I didn't stop because I couldn't handle it anymore, I just didn't have the time with the holidays and ended up always missing because I was out of town or had some event (they only offered it twice a week). 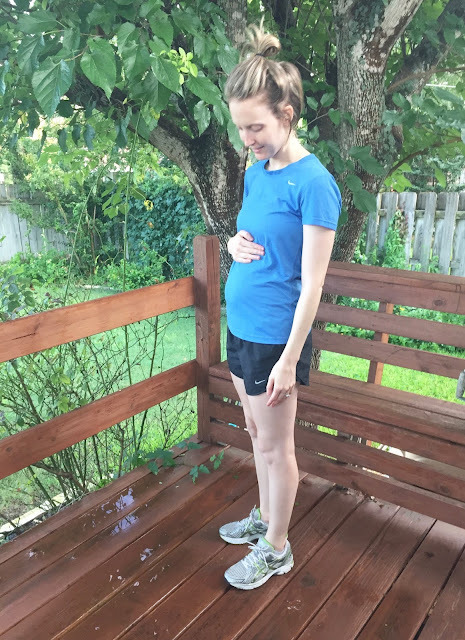 Once I hit 30 weeks, I decided not to go anymore because I was feeling very uncomfortable. I did take a few PureBarre classes at a new location that opened up near my home, and I really enjoyed them! Unfortunately, I had to stop after a few classes, because I was having to modify way too much and I hated missing out on all the core work. I mainly focused on walking, household chores, and playing with my son during the third trimester. Getting Turner ready for school, giving him baths, picking him up multiple times a day, and playing soccer/football with him wore me out and have kept me moving....a lot! The photo below is of a mile walk I took with Alex and Turner when I was 1 day shy of 35 weeks. Boy, it was hard. I definitely felt the pressure in my back and feet of the extra 43 lbs I was carrying. I'm very thankful for an able body that has been able to support my active pregnancy with twins. I hope the strength I've built during pregnancy allows me to have a smoother labor and bounce back post pregnancy much faster. I believe strength training is a big factor to staying strong throughout pregnancy, especially with your legs and core to support the extra weight and growing belly. 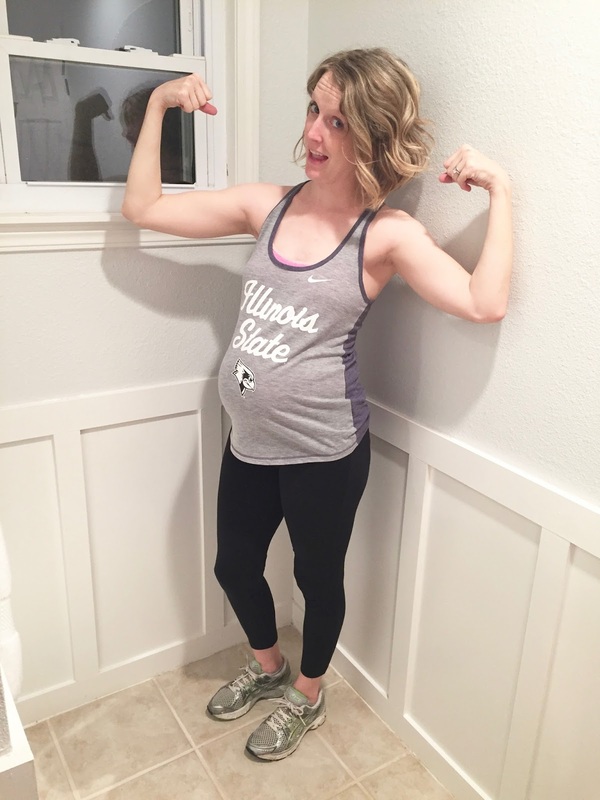 Did you work out during your pregnancy? If so, what types of exercise did you do?